I went to a very good series of presentations at the War Museum titled SAFECYCLING IN CANADIAN CITIES, hosted by the Canadian Institutes of Health Research. The four presenters had diverse learned perspectives on a topic obviously close to my heart. Gil Penalosa of 8-80 Cities was particularly good, as was Dr Patrick Morency, a community health and preventative specialist who’s research focuses on transportation systems, road injuries and active transportation. To get there, on day 29 of 30 Days of Biking, I rode down Nanny Goat Hill via Bronson. Rather than follow the path that goes past the Mill St Pub and brings you to the north end of the museum, as I would have done if I wasn’t running late, I zipped up the path past the Firemans Memorial to the Sir John A Parkway. Don’t do that. There is no crosswalk light to get to the other side of the Parkway and it’s pretty much a freeway. On the way back I took the safer route (red line). I also wanted to go to the Dalhousie Community Centre AGM so I rushed over to the community centre and caught the tail end of the guest speaker’s presentation. All very exciting, and nary a photo to show for it. Sorry. 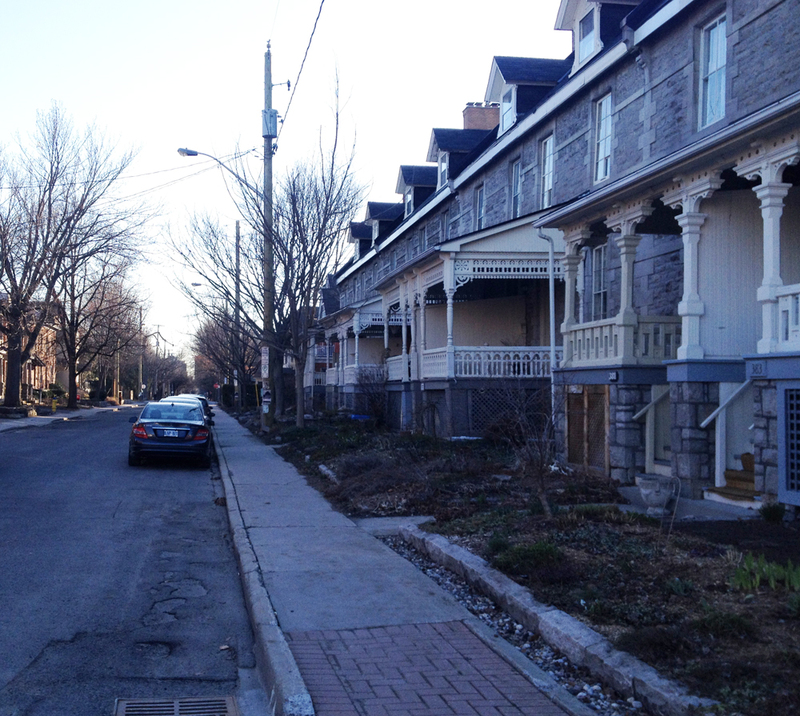 30 Days of Biking – Day 28 : Ride through Hintonburg to do some banking, then along the river home. Today I biked to to the bank. My main branch is on Sparks St, but the Sparks St BIA is so rabidly anti-biking they not only forbid riding, they chop locks and confiscate bikes whenever it meets their fancy. Fortunately we live in the age of bank machines, so on day 28 of 30 Days of Biking I wove my way over to the one in Hintonburg. 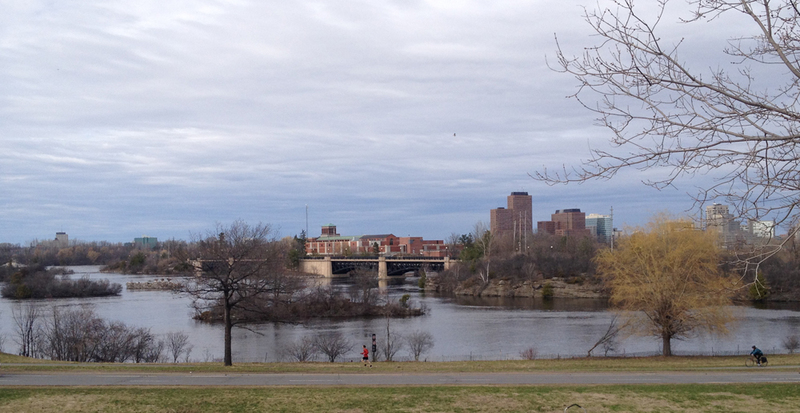 Transaction completed, I headed north to the Ottawa River and meandered along its shore towards home. Here’s how. Detailed description of routes to the bank can be found on my Day 2 blog entry, a combination of which I followed today. To get back home I rode north along Hinchey towards the river. Hinchey dead ends but there’s an accessible opening onto NCC lands. 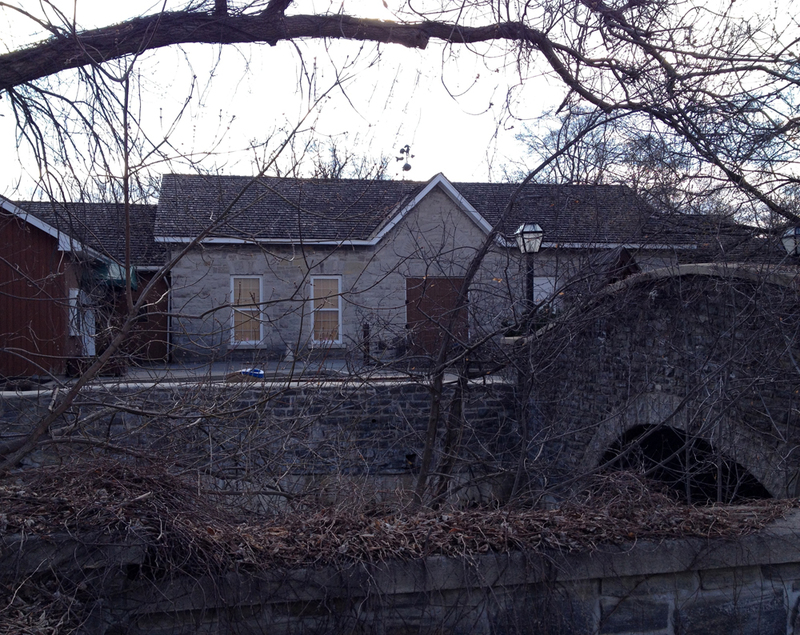 A bit further on there’s a fine view of the bridge onto Lemieux Island. There isn’t an official trail through this area, but the paths are well trodden and very bike-able. I took the one to the right which led to the intersection of Slidell St and the parkway. 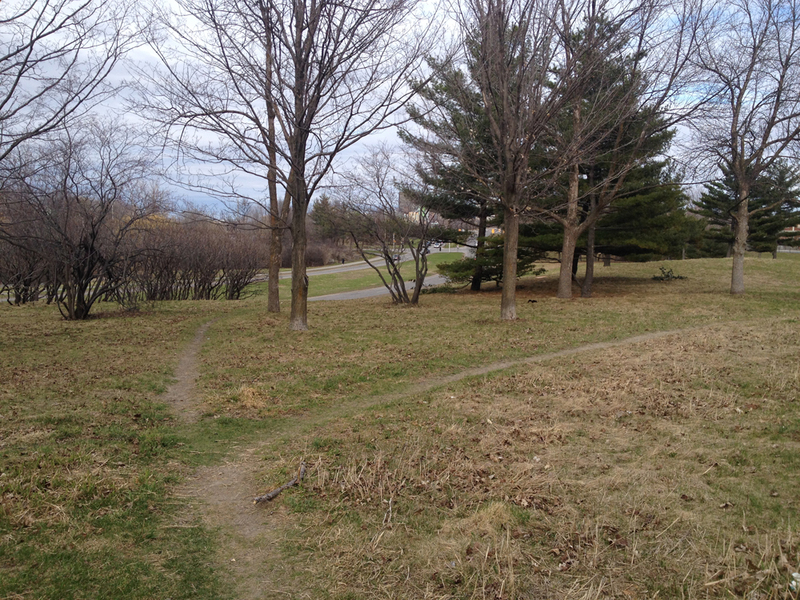 So many paths to choose from…. From there I rolled onto the bike path and headed home. Author ottawaveloPosted on April 28, 2014 April 28, 2014 Categories Art & Architecture, Ottawa, RiversLeave a comment on 30 Days of Biking – Day 28 : Ride through Hintonburg to do some banking, then along the river home. The annual Spring clean up of the Centretown Community Garden Project took place this morning so I rode over to lend a hand. Lot’s of fantastic folks all getting together to clean up the site and yack about what to plant this year. 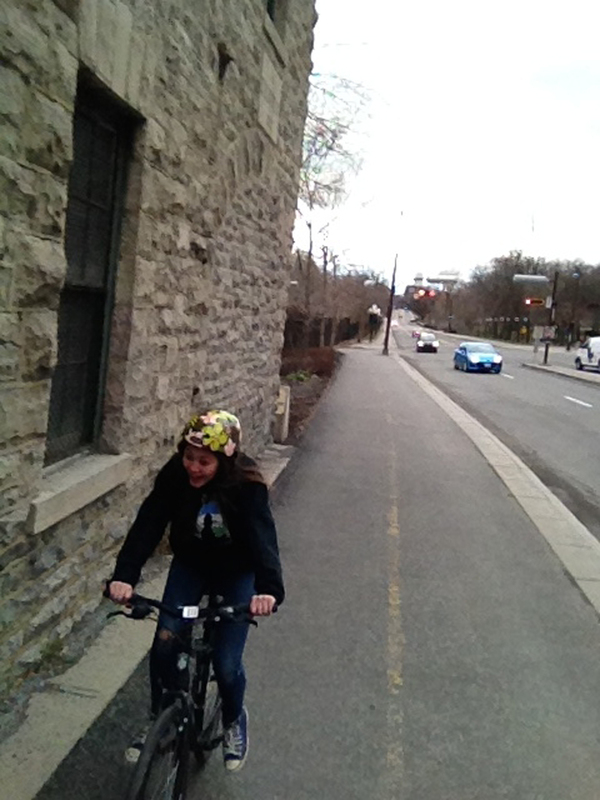 I then biked over to Théâtre de l’Île with my talented assistant Mika to get some set work finished up. Short jaunts but energizing none-the-less on day 27 of 30 Days of Biking. 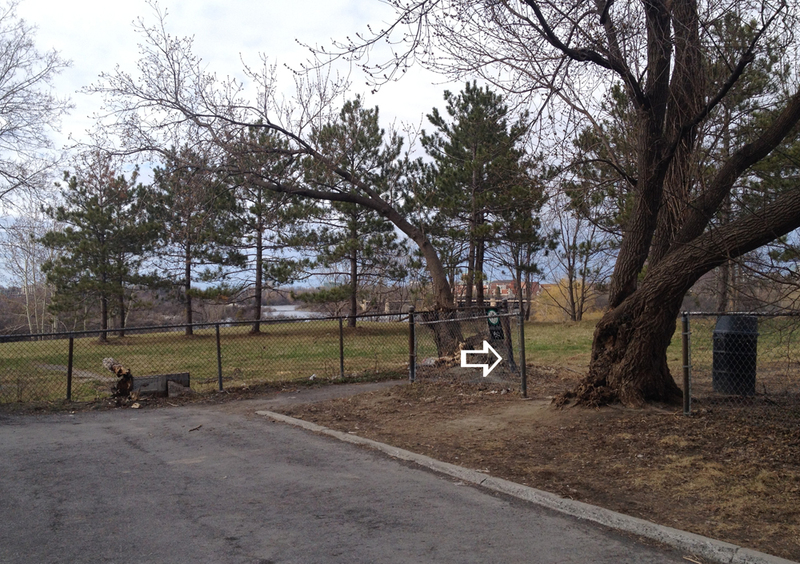 The Centretown Community Garden is located at the corner of Lisgar and Lyon St N. To get there I followed the same route as described on Day 1 (seems so long ago) as far as Lyon St. Then it was half a block on Lyon to the garden. It was a fine day for a ride to the theatre. 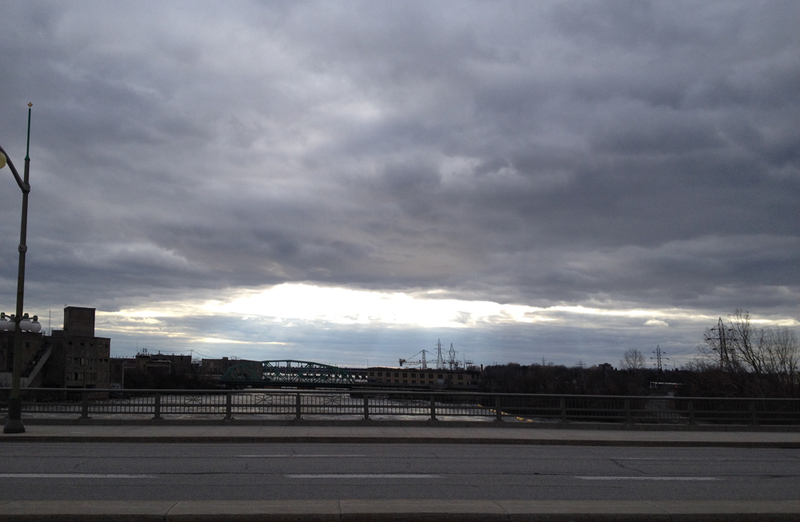 The sky above the Chaudière dam was impressive when we biked over the Portage Bridge. The ride home was great too. 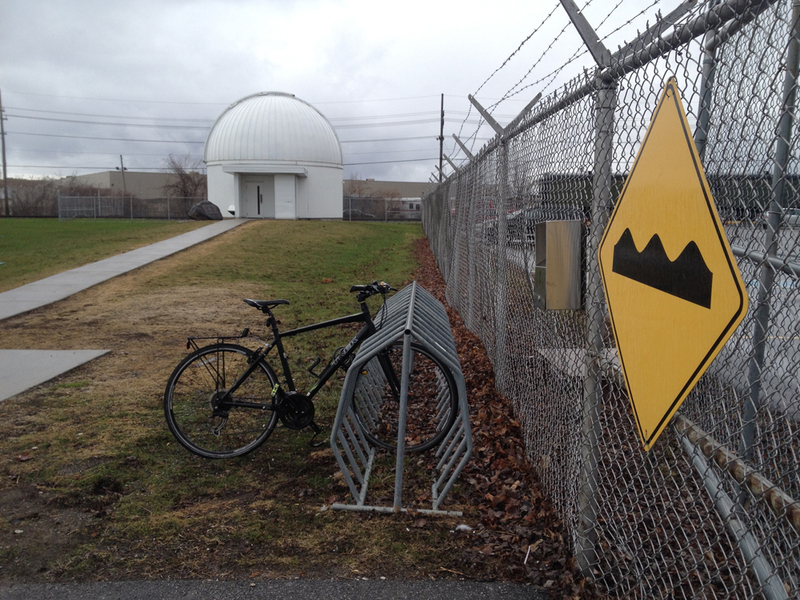 I needed to pick something up at the Museum of Science and Technology so I rode there, on Day 26 of 30 Days of Biking. Blue line on the map shows route I followed there. Red line is the one I took to get home. One thing I like about riding at this time of year is the opportunity to notice details within the landscape less visible once the trees have sprouted leaves. 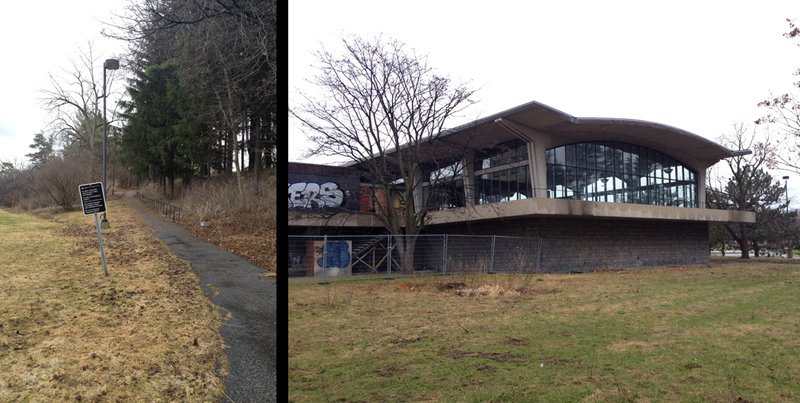 Such as this pavilion, attached to the back of the slowly disappearing Sir John Carling Building presently being torn down. I hope it avoids the wrecking ball. You can take this narrow path up to take a closer look. I then biked through the Arboretum, crossed the locks across from Carleton U, and rode up the bike path towards Mooneys Bay. The path gets a little convoluted at Mooneys Bay. You can ride over the falls along the path on the west side of the street, but you won’t see the falls, which are pretty spectacular at this time of year. or you can cross back under the road and ride over the falls the east side, as I did and indicated on the above map, where you will catch great views of the falls. It means carrying your bike up a few steps. I rode down along the Rideau River Eastern Pathway (no more flooding) then turned up Pleasant Park Road, which around Pleasant Park Woods, isn’t so pleasant. 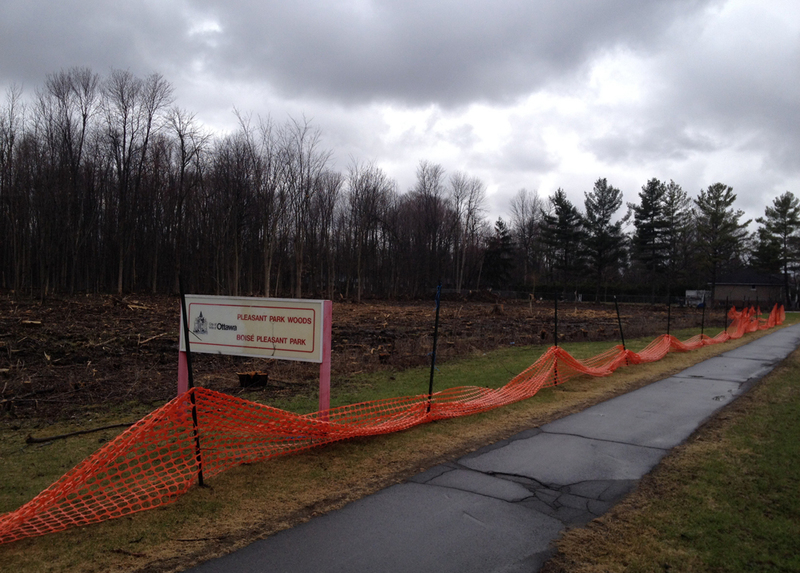 This huge swath of trees has been cut down because of the Emerald Ash borer bug. I took a short cut through Weston Park to Weston Drive. 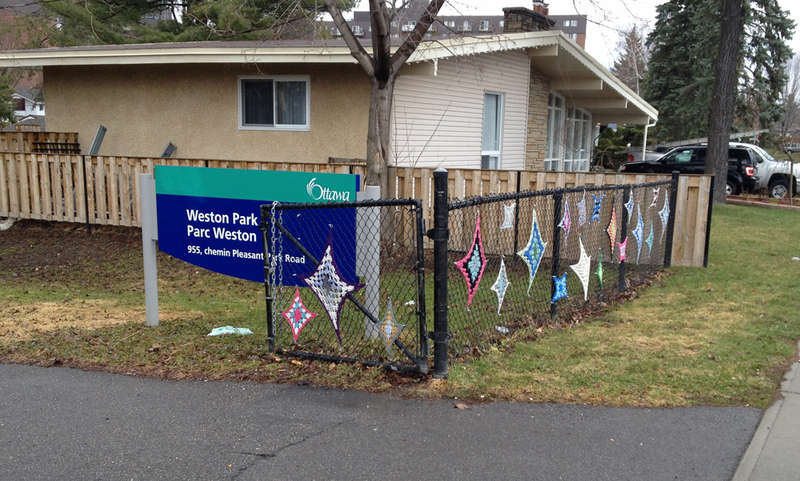 It’s the one with the colourful works of crochet stretched on the chain link fence. 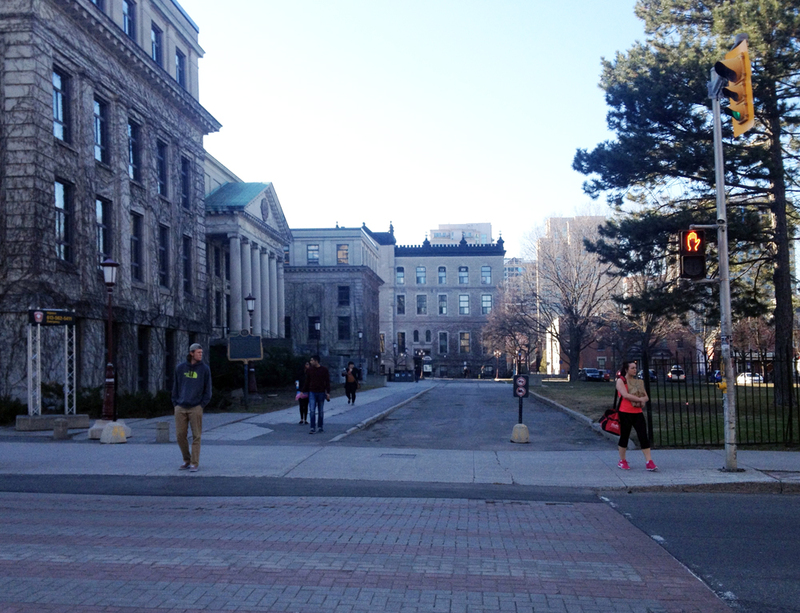 Weston Street is on the other side of Weston Park, which I followed to Othello St. I rode north along Othello then cut through the Elmvale Acres Shopping mall parking lot to the intersect at Smyth Road and St Laurent Boulevard. 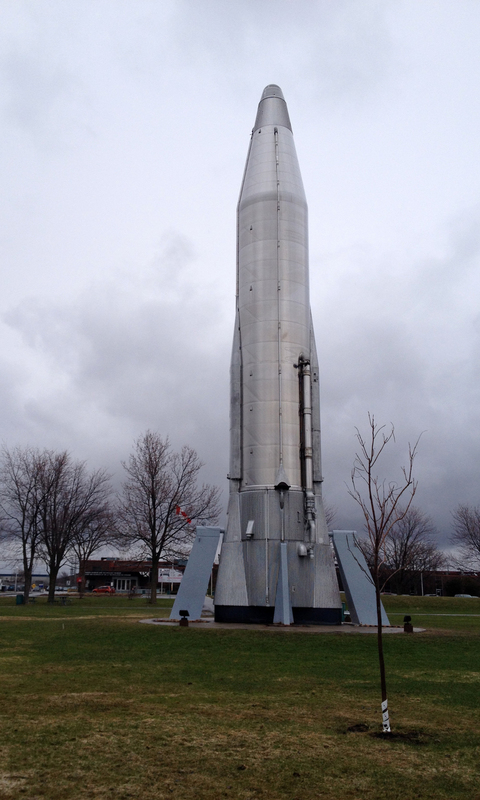 I then rode through the huge park in front of the museum, which brought me up close to a giant old locomotive and the big silver rocket. Bike parking is located just to the north of the main entrance. On my way home I turned off Pleasant Park road onto the bike path that goes past the allotment gardens and followed the same route described in this post. Et voila – only 4 more days to go! 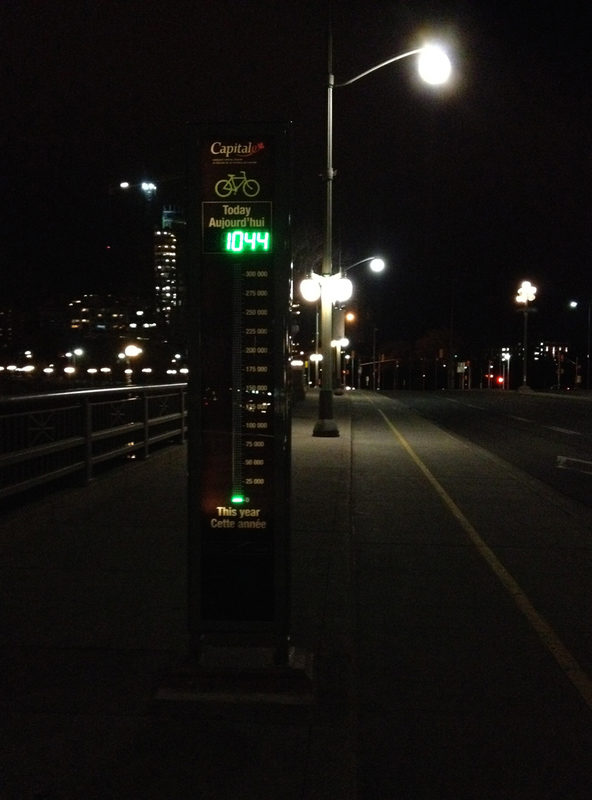 Day 25 was so crazy busy that I didn’t have a chance to hop on my bike, so to meet my 30 Days of Biking pledge I decided to go for a late night ride down to Nepean Point behind the National Gallery. It was great. I rode along the Ontario side of the river and back along the Quebec side. Here’s how. 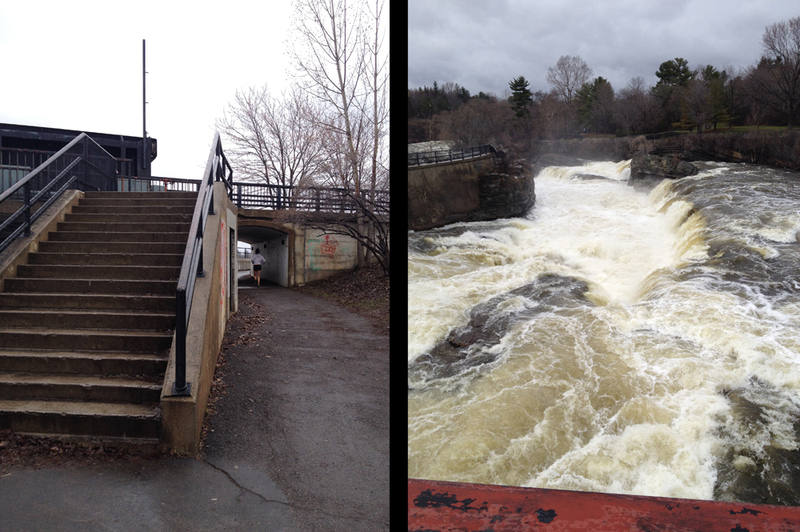 To get down to the Ottawa River Pathway from Chinatown I took the stairs at the end of Empress Avenue. Good lighting and bike ramp. 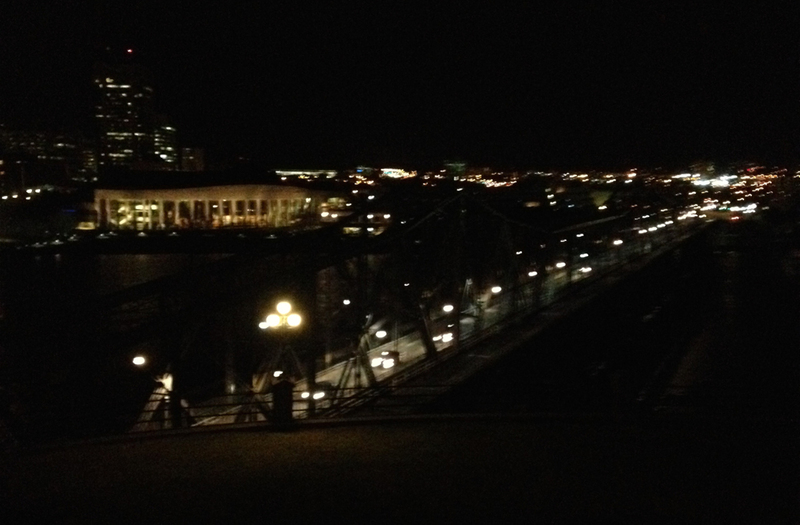 On a late night ride through La Capitale Nationale one is reminded of how well we light our national edifices. 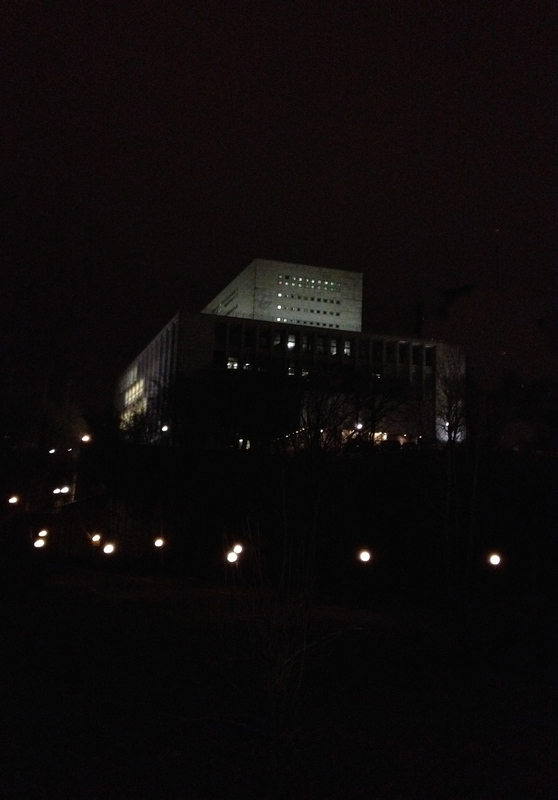 Take, for example, the always impressive Library and Archives Canada, as seen from the Ottawa River Pathway. 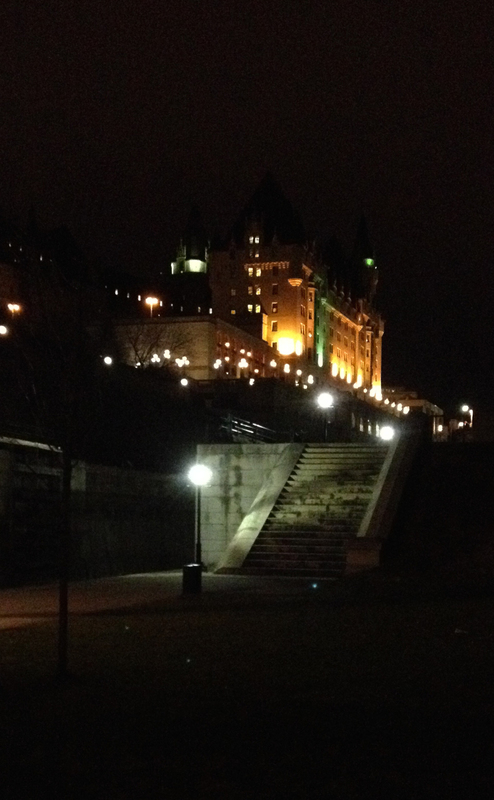 And of course there’s always fabulously lit Chateau Laurier, as seen from the Rideau Canal locks. 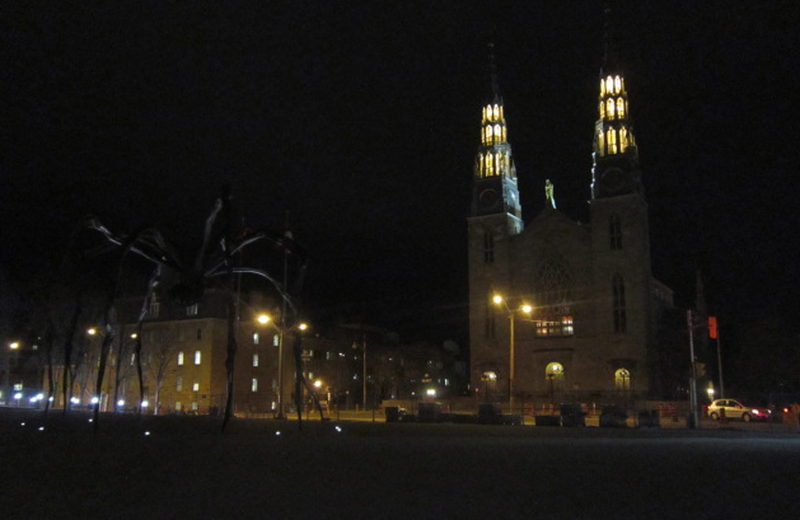 Maman, the spider sculpture by Louise Bourgeous, sits infront of The National Gallery, across the street from the elegantly lit Notre Dame Cathedral. 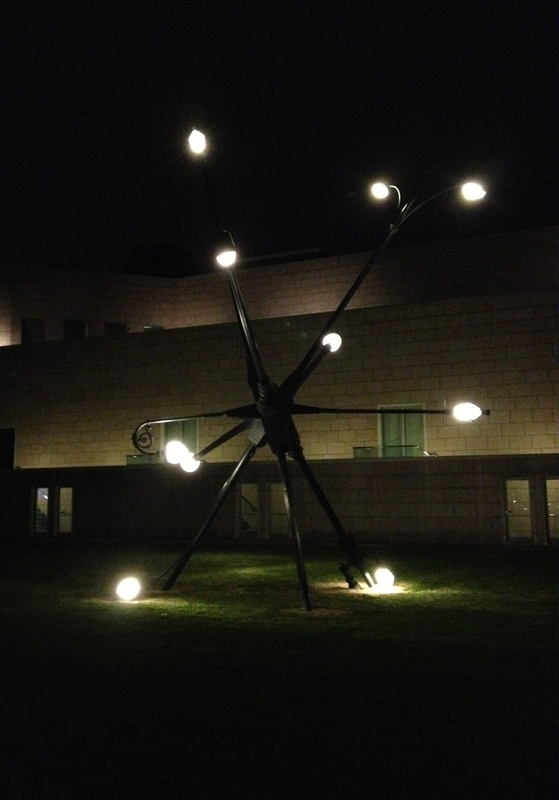 Off the path up to Nepean Point sits this Majestic sculpture, composed of lamp posts blown over by Hurricane Catrina in New Orleans. Looking across the river from Nepean point you can see and hear the sound of the car wheels humming over the Alexandra Bridge’s metal surface. It’s a fantastic place to watch summer storms roll in along the Ottawa River, or to watch the Equinox sunrise. I crossed the river along the bike path and zig zagged down to the Voyageurs Pathway behind the Canadian Museum of History. It’s a great time of day to view the large impressive sculptures within the Grand Hall. 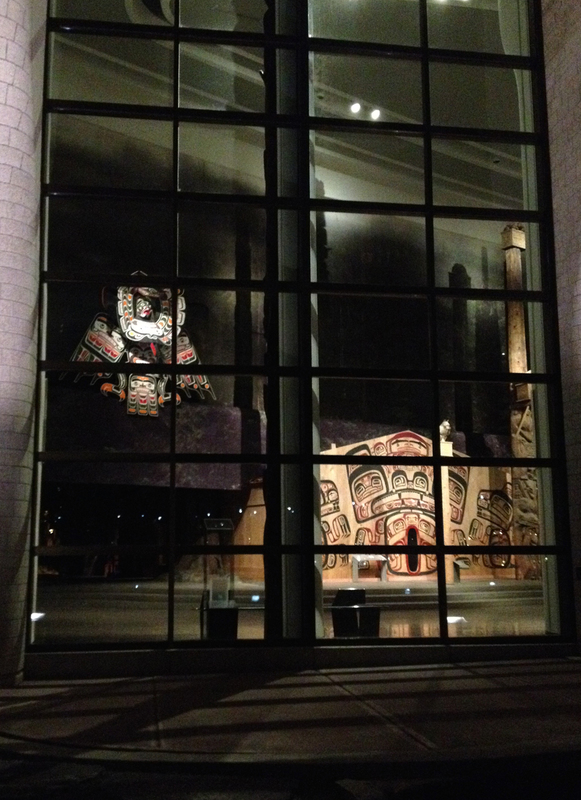 Many of these works were meant to be viewed from a distance which is possible when looking through the windows from outside into the space at night. I rode along the Voyageurs pathway, which was very serene, to the Portage Bridge where I crossed back into Ottawa as rider number 1044 for the day. 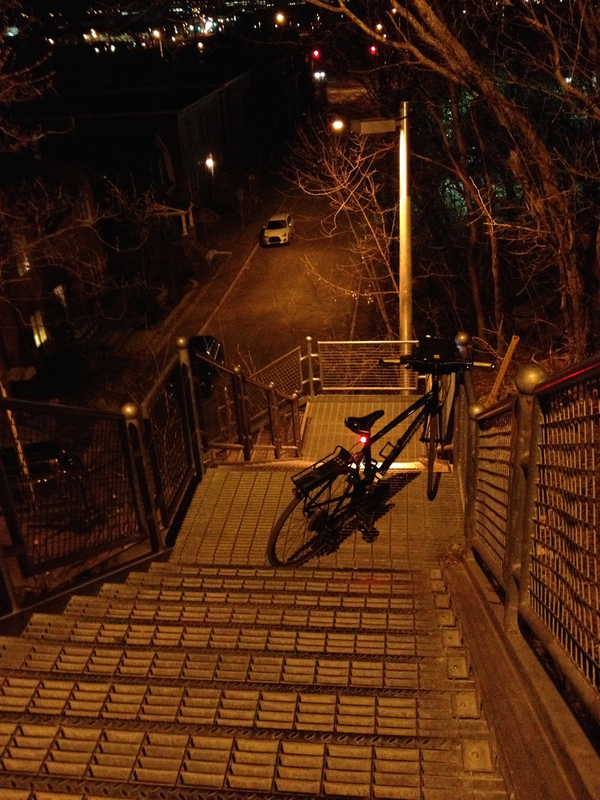 30 Days of Biking – Day 24 : Chinatown to Vanier to pick up Indian take-out. 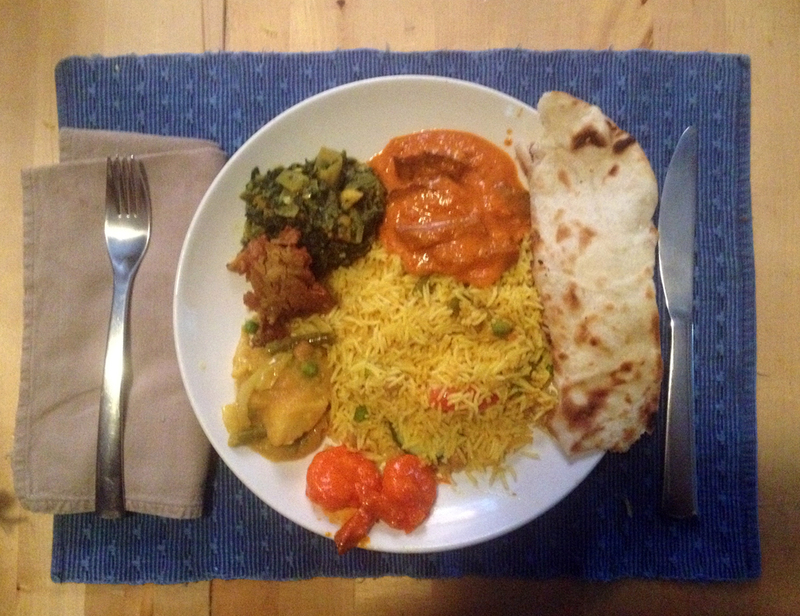 Golden India Restaurant in Vanier was highly recommended to us by a friend from India, so this evening I rode over and picked us up a yummy feast! We placed our order on line, which was very convenient. The restaurant called back to confirm the timing just as I headed out the door. I gave myself 30 minutes to get there, which turned out to be accurate as I’m not a particularly fast cyclist. I mapped out a route that mostly took me along cycle lanes or quiet residential streets. There were, however, a few short linking sections where the roads are not very safe for cycling. I have hi-lited those in red on the attached map. Laurier is fantastic along the Laurier Bike Lane and over the canal bridge which has bike lanes, but dangerous between Elgin and the bridge, and east of the bridge, particularly right around Ottawa U. That’s why I got off Laurier as soon as I could by cutting across campus to access quieter streets through sandy Hill. 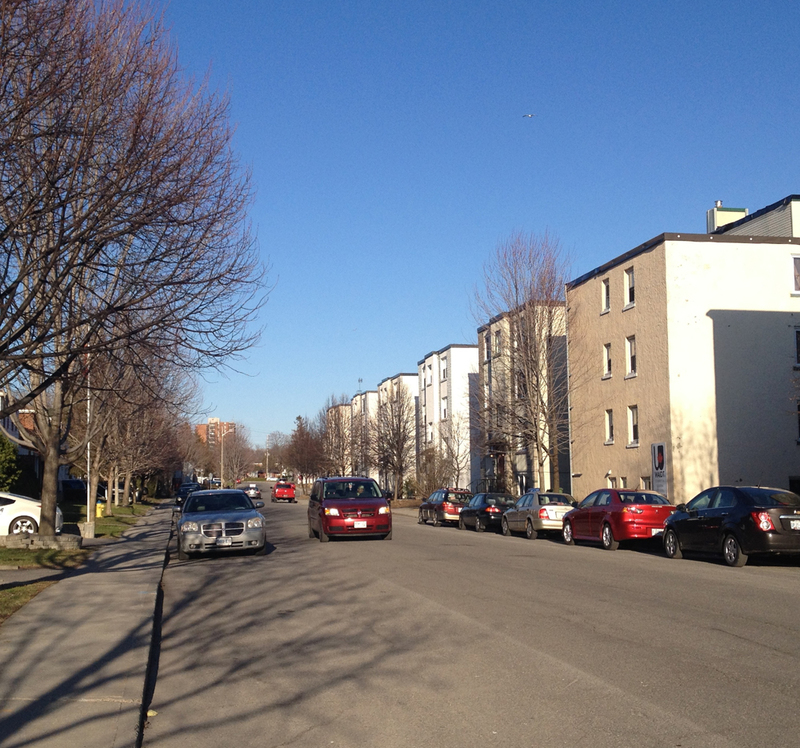 Here are some nice row houses I passed along Daly Ave. The next danger zone along this route was over the Cummings Bridge into Vanier. 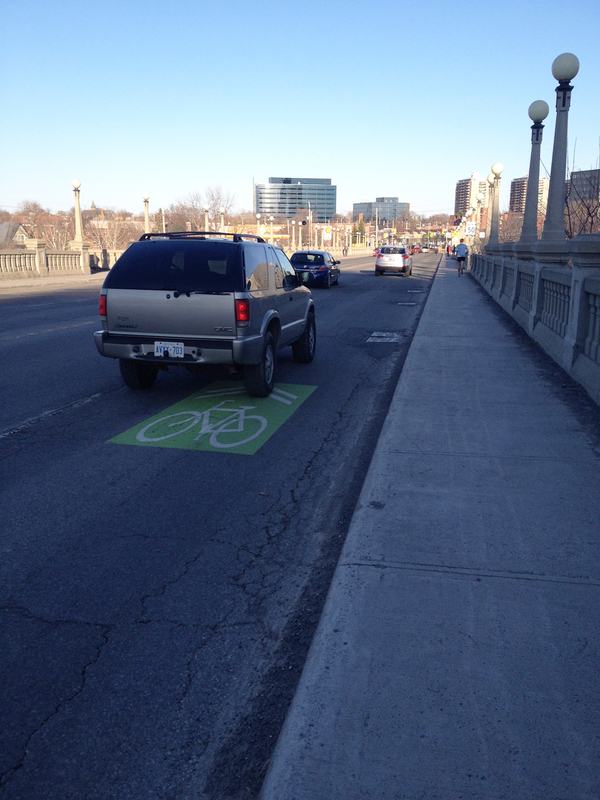 There is a bike lane heading west, but none heading east. They have painted sharrows in green boxes along the east lanes but no matter how you dress them up, sharrows are the most useless form of bike accommodation imaginable. Worse than useless, they are dangerous because they falsely suggest to riders that they are designated safe routes when drivers ignore them because they can. Montreal Road is pretty nasty too – no shoulders, lots of potholes, and a main artery for cars commuting east – so I rode along it as far as the Vanier Parkway and cut through to Kendall Avenue. I then rode safely along quiet streets through Vanier until I was close enough to Golden India restaurant. McArthur is a busy street and dangerous to ride down so I avoid it. The food was all packed up waiting for me and the service was fantastic. They even included some complimentary rice pudding. I filled my panniers and headed home. Made it safe and sound. It was still warm and very yummy. Author ottawaveloPosted on April 24, 2014 April 24, 2014 Categories Ottawa1 Comment on 30 Days of Biking – Day 24 : Chinatown to Vanier to pick up Indian take-out. Rode to a couple of locations on day 23 of 30 Days of Biking. First foray had me pedalling to Le Théâtre de l’Île (blue line on the map below). Second one was to the Royal Oak in the Minto building for the annual Spring meeting of the Centretown Garden gardeners (red line). 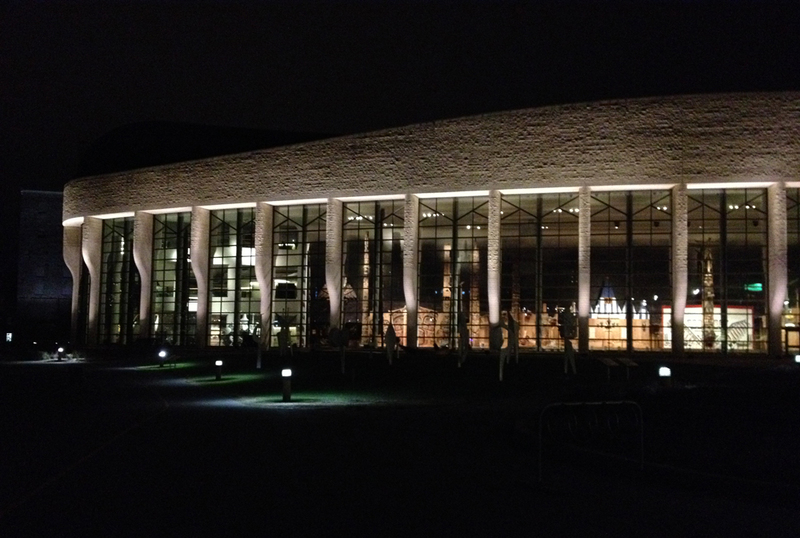 Théatre de l’Ile is a wonderful performance space in Gatineau. More about the theatre in this post. 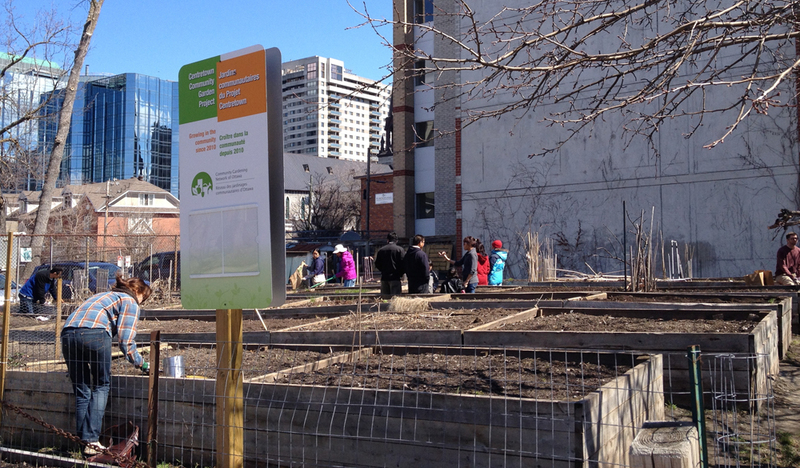 The Centretown Community Garden is located at the corner of Lisgar and Lyon. This year’s annual Spring meeting for gardeners was held just a few blocks away at the Royal Oak on Kent St. I never knew this pub existed, most likely because I never bike down Kent. 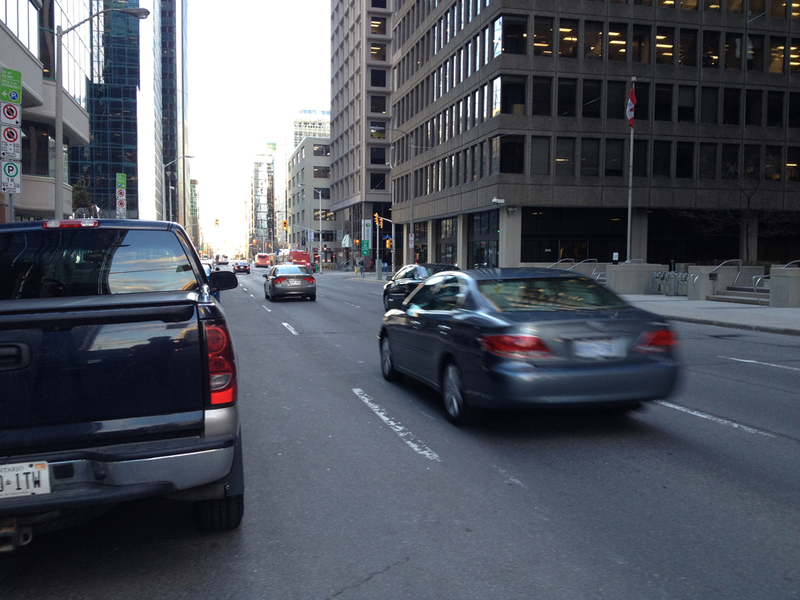 It’s a three lane one way street with no bike infrastructure and very speedy traffic heading north. The entrance to the pub is half a block north of Laurier so I walked my bike back to the Laurier Bike Lane to get home.